The design is intended to be highly readable, reasonably compact, and visually attractive. The additional ‘extended’ Latin letters are designed to naturally harmonize with the traditional 26 ones. Diacritics are treated with careful thought and attention to their use. Gentium Plus also supports both polytonic and monotonic Greek. Gentium Basic and Gentium Book Basic give a preview of what a whole range of new weights will eventually look like. The ‘Basic’ fonts only support a limited Latin character set (no Greek or Cyrillic). Gentium Book is a companion family to Gentium that is altogether slightly heavier, and better suited for some publishing needs. It supports only the Basic character set at present, but will eventually match the full Gentium Plus character set. The Gentium font families are freely available and may be used by anyone at no cost. They are released under the SIL Open Font License, a free and open source license that permits modification and redistribution. Our hope is that it will stimulate literature production and elevate extended Latin alphabets to greater parity with the basic Latin alphabet. We also hope it will encourage other type designers to appreciate and support those fascinating and beautiful extra letters. For a complete list of characters included in Gentium Plus and Gentium Basic, see Character Set Support. 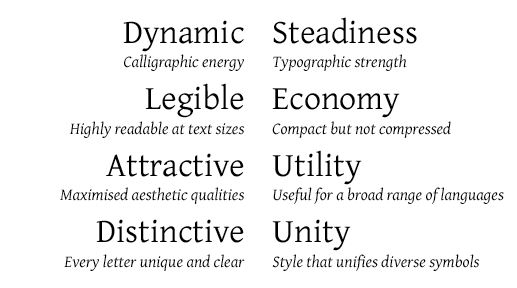 For full details on the unique design characteristics of Gentium, download the 20-page type specimen: Gentium Type Specimen (A5 format). This publication was prepared for the University of Reading and was distributed to all attendees of the ATypI conference in Rome, September 2002. It also includes examples of the glyph set supported by Gentium and shows it in use for a variety of settings (Regular/Italic, Latin/Greek, Prose/Poetry, Display/Text). An exhaustive set of proof sheets is also available that shows the complete glyph inventory of each font in a range of sizes: Gentium Proofs (A3 format). A document showing Polytonic, Monotonic and mixed Latin with Greek is demonstrated in the following specimen: Gentium Greek Specimen. SIL International is the creator of the Gentium fonts, and is the owner of all proprietary rights therein.